How many times have you heard someone say they need Photoshop to edit photos? Perhaps because it was first, or because talented artists have done amazing things with it over the years, Adobe Photoshop has become synonymous in many people’s minds with manipulating digital photos. And yet, Photoshop is one of the biggest iceberg applications out there: Most people, even many experts, use only a small percentage of what Photoshop is capable of. That’s why Adobe also sells Photoshop Elements. 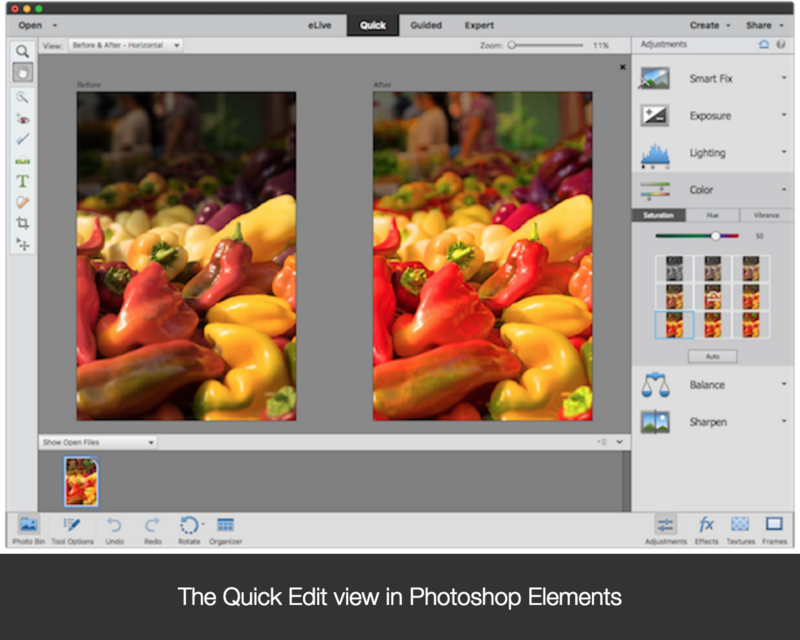 Originally designed as a “Photoshop Lite,” Elements is now nearly as capable as its older sibling, especially for most general-purpose photo editing. 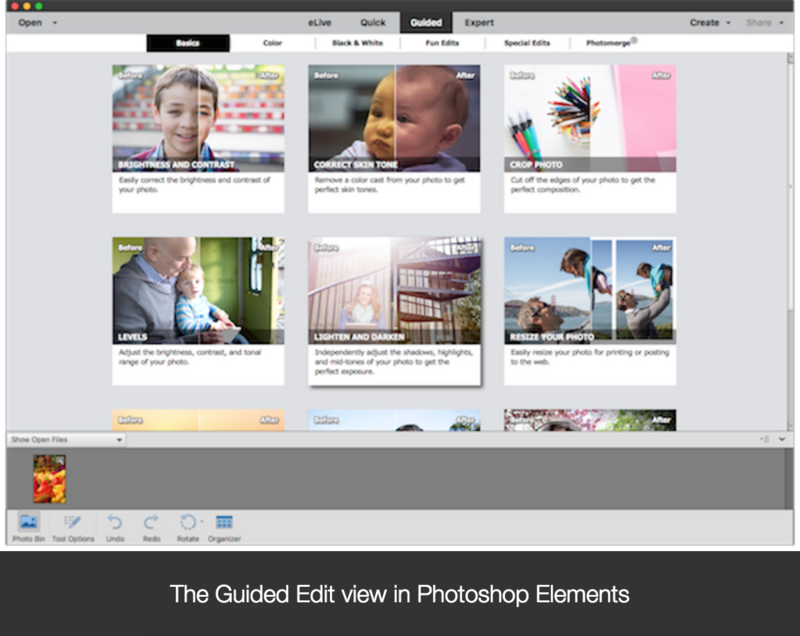 If everyone thinks they need plain Photoshop, how do you determine which application is actually a good fit? In general, Photoshop Elements appeals to customers who are just starting out or who have an intermediate level of experience editing photos. Adobe has incorporated features that walk users through steps to correct, retouch and create novel effects on their photos; some of those features save a lot of time compared to getting the same results in Photoshop CC. Photoshop Elements has also found a home among scrapbookers, teachers and people who need to create posters and other materials without becoming image-editing experts. Photoshop CC users tend to be intermediate-to-advanced image editors, with a high concentration of professionals such as high-end photo retouchers, advertising agencies, Hollywood studios and the like. That’s a broad brush to apply, I admit, and you’ll find plenty of exceptions within the Photoshop orbits: advanced editors who don’t need all of Photoshop CC’s features (or cost), people of varying skill levels who need specific tools found only in Photoshop CC and so on. But taking a look at which features are present in each application reveals a lot about which markets Adobe is targeting. Whereas Photoshop CC is a vault of features you can pick and choose from as you need them, Photoshop Elements includes modes that walk you through many operations, depending on your skill level. Photoshop CC assumes you either know how to use its features, or you’re going to look elsewhere to learn all of its ins and outs. Photoshop Elements, on the other hand, includes modes that walk you through many operations depending on your skill level. The Quick Edit view presents several common adjustment types (exposure, color, sharpen) using visual previews: click the thumbnail that looks best. You can then fine tune the adjustment, or alternately click Auto to let the application do the correction. The Guided Edit view, redesigned in Photoshop Elements 14, steps you through the actions needed to make adjustments, or perform edits such as restoring old photos or changing the perceived depth of field. 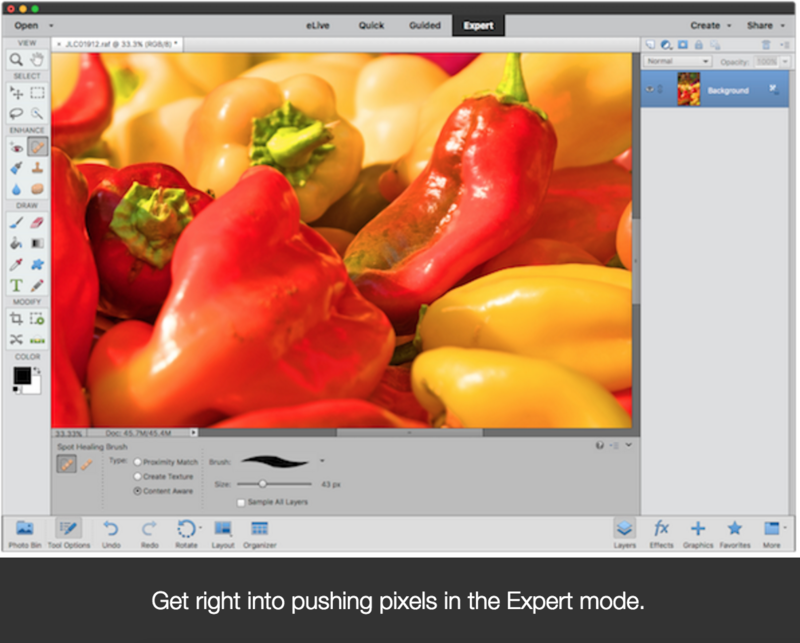 In the Expert mode, which is the closest to Photoshop CC’s normal working mode, you get features such as layers, masking and the host of common Photoshop tools. For photographers looking to manage their images, Elements includes the Organizer, a way to collect, tag and find shots within a central library. Photoshop CC assumes that you’ll use Lightroom or some other method to manage your libraries. In terms of specific features, Photoshop Elements boasts a long list. 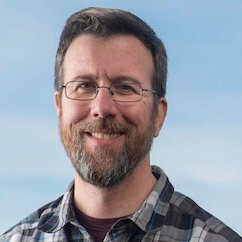 The most important one, however, is the heart of the software: Elements is built using the same core imaging technology of Photoshop CC. All the research and development that Adobe’s engineers put into making Photoshop CC the premiere tool for pushing pixels is also available to Photoshop Elements. Not everything gets in, of course. Elements doesn’t support CMYK files, which means it’s not an accurate tool for sending jobs to press. Also, specialized Photoshop CC features such as working with 3D objects are also absent. Some features are restricted. 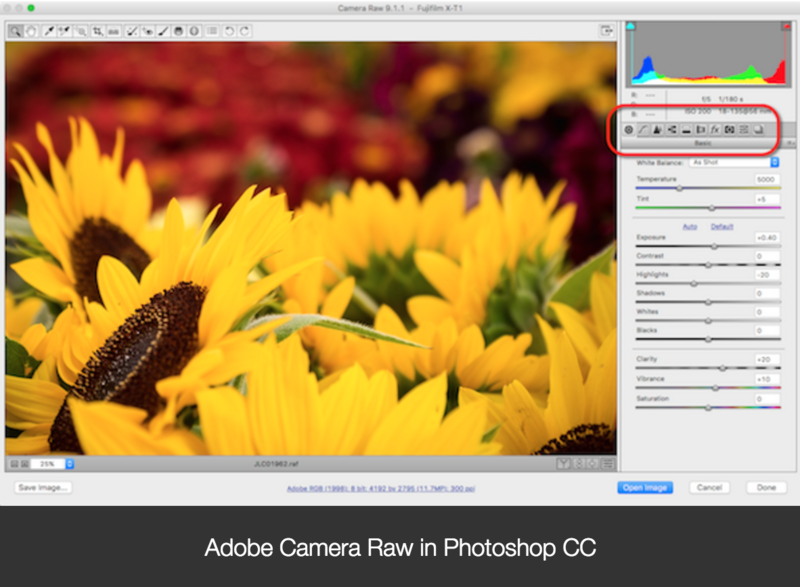 Both Photoshop CC and Photoshop Elements include the Adobe Camera Raw module for working with raw-formatted image files, but the one in Elements has fewer options. Photoshop Elements is typically built on the previous generation of Photoshop’s engine; many of the previous year’s star Photoshop features would appear in the current year’s version of Elements. For example, Content-Aware Fill first appeared in Photoshop CS5 in 2010, and made its way to Photoshop Elements 9 in 2011. 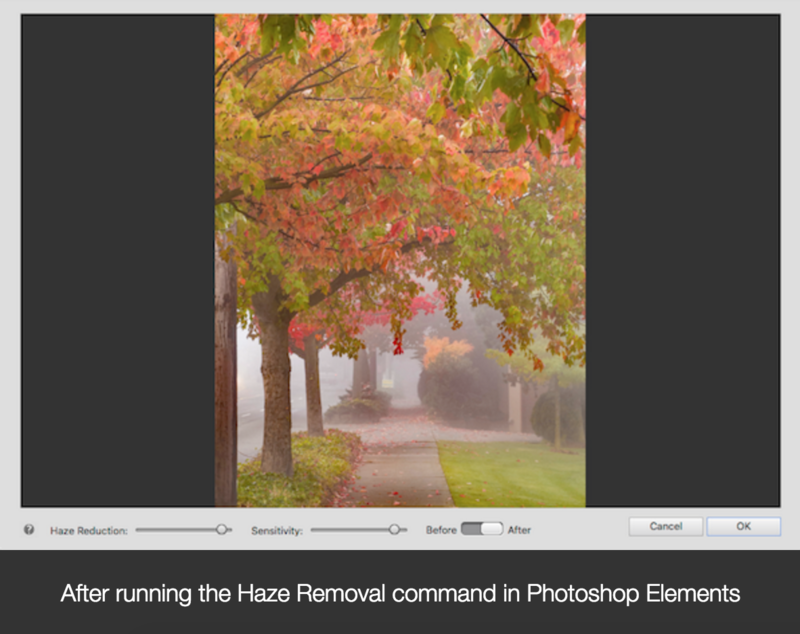 Photoshop Elements, for example, includes a Haze Removal feature introduced in 2014 in Photoshop CC and Lightroom CC. Although we often like hazy, misty images, sometimes it’s nice to have control over how much haze is in the shot. 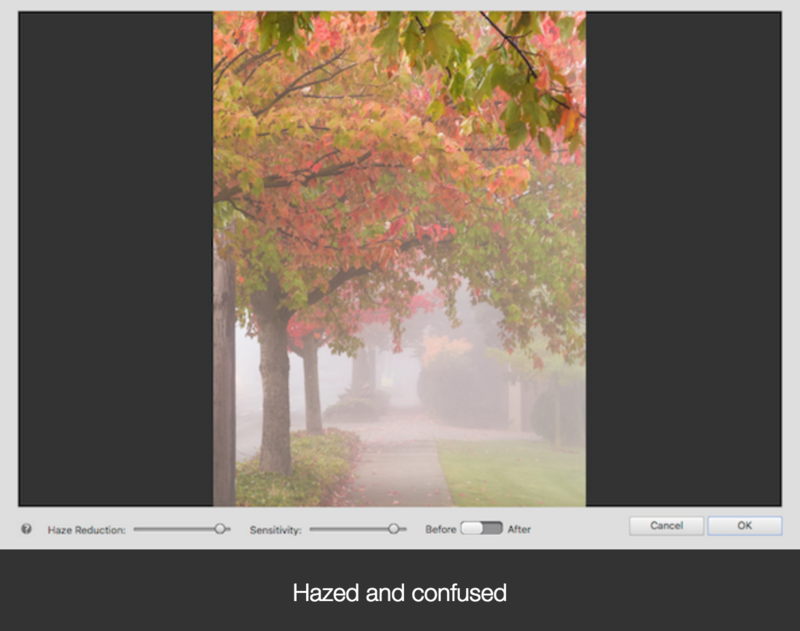 Another feature is the ability to sharpen images that are blurry due to camera motion. Photoshop Elements also includes advanced features that either are not in Photoshop CC, or are more difficult or time consuming to apply. For example, the Photomerge Scene Cleaner lets you combine several photos of the same scene (say, a popular tourist attraction) such that people strolling by are no longer in the shot. We have dozens of courses on Photoshop on LinkedIn Learning. See them all here.